the Italian cultural Association of the Vintage Fashion Researchers will hold a special exhibition of one-of-a-kind period purses and shoes at the Foyer of the Theatre Gentile in Fabriano, as a highlight of the 4-days lasting Creativity Expo in the so called exhibition area “Arts & Events”. Around 50 rare highly collectable and unique exemplars dating back to the 40’s to the early ‘80’s will be displayed on an amazing labyrinth of Plexiglas showcases in the Foyer of the antique Theatre Gentile, on Via Gentile da Fabriano, 60044 Fabriano (Ancona) from the 4th to the 7th of September (opening times: Thursday, Friday and Saturday: 5pm through to 11pm; Sunday 10am to 11pm). Interesting to know: The purses and shoes on show will be an absolute première as they will be exhibited for the first time and most of them, the rarest or most unique pieces, are not even illustrated on the main books about collectable purses. All the exemplars have been especially selected and extracted from the private collection "Sculptures to Wear" by A. Eupani and from the Vintage Workshop® Accessories Archives of Vicenza, Italy, available for rentals and consultation for the fashion designers and product managers of the international Ready-to-Wear and High Fashion companies. The luxury concept will be explained under different aspects: the aesthetics pondering, the handcrafted components, the heritage of past ages, the design & creativity assets, the top quality stands of both manufacture and materials, some of the leading early fashion accessories brands as seen at their apex (Roberta di Camerino, Gucci, Ferragamo, Cesare Piccini and others for Italy; Hermès, Chanel and Céline for France; Rialto, Wilardy, Llewellyn, Patricia of Miami, Maxim’s, Myles, Rosenfeld and others for the Unites States as first example of high creativity in the ‘40’s and ‘50’s at the time of the early creations of futuristic purses in Bakelite and Lucite precursors of plastics). The Vintage exhibition will be accented and complemented with the contemporary crafts garment by the dressmakers’ clothing companies Memory’s and Sartoria Luca Paolorossi. The interior design installation and the special lighting system, with cold led lights due to the peculiar microclimate necessary to preserve the pre-plastic handbags, has been projected by the architect Francesco Sforza. The conceiver of the Vintage exhibition organizing Association (Vintage Workshop® www.vintageworkshop.it), Angela Eupani, will be guest and spokeswoman at the press conference and forum of the creativity with title “Creativity and beauty as a medium for the development of the excellencies of the territory and tourism” co-ordinated and patronized by the University of Camerino, with live stream broadcasting by the radio channels “Radio Gold” and “Radio Blu”. 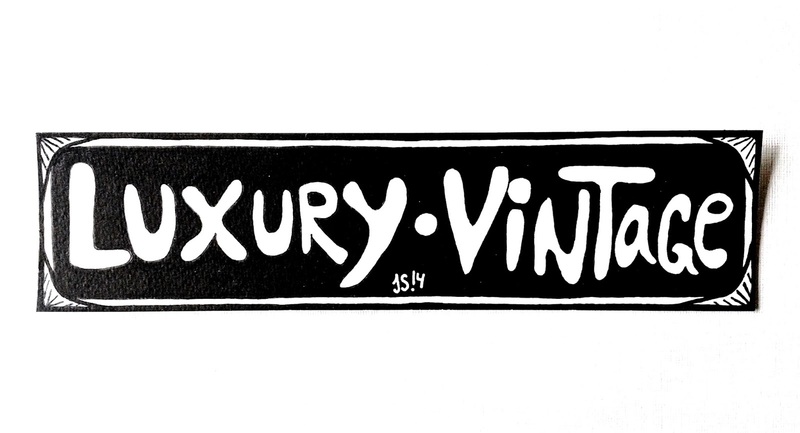 Special thanks to the artist Jacob Sibbern for the drawing art lettering of the Luxury Vintage logo of the exhibition.